We’d love your help. Let us know what’s wrong with this preview of Malala's Magic Pencil by Malala Yousafzai. As a child in Pakistan, Malala made a wish for a magic pencil. She would use it to make everyone happy, to erase the smell of garbage from her Nobel Peace Prize winner and New York Times bestselling author Malala Yousafzai's first picture book, inspired by her own childhood. To ask other readers questions about Malala's Magic Pencil, please sign up. Shelving debate query-would you put this in biography or women's education? Kiki I would put it in children section. I feel very conflicted about this book. I rarely *not* rate titles, since I absolutely love giving my opinion on books and ratings are what people first see when they look at reviews, but this book is not at all what I expected, and yet, I’m not at all surprised. The problem is that it doesn’t introduce anything new. Those that know a little bit about Malala will understand. I read her memoir (the young readers edition) last year, so I couldn’t wait to start this book, because I thought it would I feel very conflicted about this book. I rarely *not* rate titles, since I absolutely love giving my opinion on books and ratings are what people first see when they look at reviews, but this book is not at all what I expected, and yet, I’m not at all surprised. The problem is that it doesn’t introduce anything new. Those that know a little bit about Malala will understand. I read her memoir (the young readers edition) last year, so I couldn’t wait to start this book, because I thought it would be an heartfelt tale. It is—if I look at this book objectively. But that’s impossible. I’m not omniscient. My opinion cannot be the world’s opinion, if that makes sense. Of course I’m going to look at this book with my own personal eyes and think my own personal thoughts. And what my mind is telling me is that this book is a condensed replica of this author’s other works. Actually and unfortunately, it’s like a summary of her memoir (the young readers edition). She talks about the TV show she used to love watching as a child, her love of education and how she became a symbol of hope and equality—eventually winning the Nobel Prize. That’s all very interesting and indeed heartfelt, but this book didn’t make me feel anything because her memoir already introduced me to all of this. I think it’s great that there’s a memoir for adults, one for young readers, and now a picture book for children, since Malala’s story deserves to be told, but I also can’t help but feel like it’s cheap to retell her story over and over again without including different new elements. I doubt Malala even wrote this book. I’m sure the writing was taken from the memoirs and edited to fit this format. I do recommend it to children who have never heard of Malala or don’t know much about her accomplishments, but I am quite disappointed in the content. Lovely illustrations, though, and as always, powerful themes. PS. Because of this, I am sadly glad it did not win the Goodreads Choice Awards. Each year my family reads all the Goodreads-award-nominated picture books, and we have been doing this for years. Everyone rates each book and adds a comment and it may (or may not) affect my overall rating. This is book #12 of 2017. "I knew then that if I had the magic pencil, I would use it to draw a better world." Tara: 4.5 stars. Very sweet and moving. Harry (12): 5 stars. Sad, with everything people went through and what they still go through today. Hank (11): 5 stars. Just amazing! Lyra (10): 5 Each year my family reads all the Goodreads-award-nominated picture books, and we have been doing this for years. Everyone rates each book and adds a comment and it may (or may not) affect my overall rating. This is book #12 of 2017. Lyra (10): 5 stars. Beautiful and inspiring story. Boys and girls should have the same rights. I loved the beautiful paintings. Jenn (adult family friend): 5 stars. Inspiring story and beautiful drawings. Goodreads Choice Award Nominee for Picture Book. Magic Pencil is a very special tool that was showcased in a tv serial during 2000-2004 in India. There was a boy who used to draw in his sketch book and it would come to life. Reading her book was the reminder of those childhood days. Malala's Magic Pencil is the true story of Malala Yousafzai (both her life and also her personal dreams, her wishes and aspirations) simply, sweetly, age appropriately shown but still penned in her own words (and with age appropriate I mean to say that Malala's Magic Pencil is specifically geared to younger children, to the aptly named picture book crowd). And while this book, while Malala's Magic Pencil therefore does not (and in my humble opinion very much thankfully and fortunately) in any ov Malala's Magic Pencil is the true story of Malala Yousafzai (both her life and also her personal dreams, her wishes and aspirations) simply, sweetly, age appropriately shown but still penned in her own words (and with age appropriate I mean to say that Malala's Magic Pencil is specifically geared to younger children, to the aptly named picture book crowd). 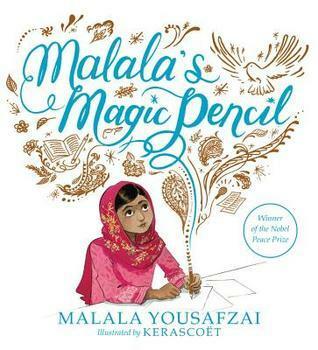 And while this book, while Malala's Magic Pencil therefore does not (and in my humble opinion very much thankfully and fortunately) in any overt manner depict and present the specifics of how she was attacked by the Taliban, nevertheless the inherent dangers faced by Malala (and her family) from the Taliban always do come through both realistically and palpably (but also the undeniable fact and truth of how fortunate Malala has actually been in many ways with regard to her family and that in particular her school principal father has always insisted on a good education for ALL of his children, and thus that the dangers emanating from the Taliban are truly and really for all intents and purposes not nearly as problematic, not in any fashion as inherently threatening as the sad and woeful lack of education, the dearth of opportunities for many children in Pakistan and similar such countries, but especially pertaining to girls and women). Now I have to admit that I was originally a wee bit leery of reading Malala's Magic Pencil, as I was somewhat worried that the issues and dangers faced (and endured) by Malala Yousafzai (the threats and the dangers she has had to face because of her outspokenness, her defiance of the Taliban and their decrees of no education for women and girls) would be rather trivialised in a picture book clearly meant for the very young. However appreciatively, in my humble opinion, this has most definitely not been the case with Malala's Magic Pencil and I have most definitely found Malala's narrative utterly charming and delightful (especially since as a child, during the height of the Cold War with its nuclear arms threats, I also used to dream like Malala of having a magic pencil on hand with which to erase pan global issues and societal problems such as poverty, war and gender stratification and then draw, create a less threatening, more just, more livable society). Dice mi hija que porque escogí un libro tan triste. 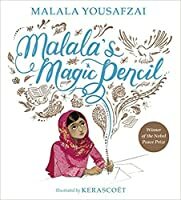 I remember reading I am Malala, and how she told the tale of the magic pencil. This story truly proves how kind and unselfish she is, even as a young child. I love how she took that idea and turned it into a beautifully illustrated story. Such an important message with stunning illustrations to accompany it! 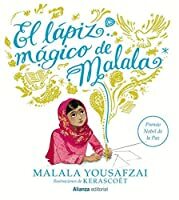 Si, hay que darle un libro para niños que los sencibilice y los haga cuestionar sobre otras realidades de nuestro mundo, este es un librito para leer y reflexionar. 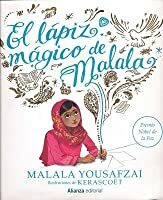 Conocía la historia de Malala pero verla desde esta perspectiva fue muy interesante y muy revelador con las ilustraciones que las acompañan, es su historia de vida, impactante. This was a beautifully told and illustrated picture book about Malala and her life before she became a famous advocate for girl's education. I would recommend for many parents to read this to their children! Ich bin ein großer Fan von Malala. Vor kurzem war Weltfrauentag und am liebsten hätte ich dieser starken Frau einen Preis gegeben oder sie einfach nur umarmt. Als ich sah, dass der NordSüd Verlag ein Kinderbuch dazu publiziert hat, musste ich es sofort lesen. Ihr wisst, dass ich eine Schwäche für Kinderbücher habe, vor allem, wenn es um Malala geht. Vor einiger Zeit habe ich bereits die Biografie von Malala gelesen. Am Ende ihrer Geschichte, war ich vollkommen fassungslos und wusste, dass ich un Ich bin ein großer Fan von Malala. Vor kurzem war Weltfrauentag und am liebsten hätte ich dieser starken Frau einen Preis gegeben oder sie einfach nur umarmt. Als ich sah, dass der NordSüd Verlag ein Kinderbuch dazu publiziert hat, musste ich es sofort lesen. Ihr wisst, dass ich eine Schwäche für Kinderbücher habe, vor allem, wenn es um Malala geht. Vor einiger Zeit habe ich bereits die Biografie von Malala gelesen. Am Ende ihrer Geschichte, war ich vollkommen fassungslos und wusste, dass ich und meine Mitmenschen unser eigenes Leben und unser Umfeld noch mehr schätzen sollten, da es vielen auf dieser Welt einfach schlecht geht. Kommen wir nun zu dem Kinderbuch "Malalas magischer Stift", welches mich von Anfang bis zum Ende absolut überzeugt hat. Die Idee des magischen Stiftes ist bezaubernd. Am Anfang der Geschichte erzählt Malala kurz, was sie alles mit einem magischen Stift machen würde. Die Protagonistin ist sehr warmherzig und will am liebsten alle glücklich machen, indem sie ihre Wünsche erfüllt. Parallel wird von Malalas Leben berichtet und ihre Beziehung zu ihrem Vater hervorgehoben, was ich sehr schön und liebevoll finde. Die Geschichte wird durch tatkräftiges Tun von Malala unterstützt und erwähnt zum Glück das böse Ereignis, welches Malala im richtigen Leben zugestoßen war, nicht. Die Ilustrationen sind sehr lebendig und kindlich gemacht und wirken dadurch auf den Leser. Ich würde dieses Buch nicht nur den kleinen Kindern ans Herz legen, sondern auch den Erwachsenen. Jeder sollte wissen, wer Malala ist und, was sie für die Frauen in ihrem Land getan hat. This was a really cute book. Malala uses nice imagery to capture her story to the youngsters. It is uplifting and simple, something great for the youngsters. Um livro tão lindo e com uma mensagem tão importante!!! 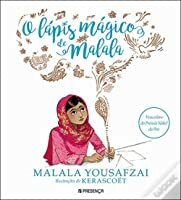 Gostei bastante deste livro, em particular a ligação que é feita entre a "magia" do lápis ("the pen is mightier than the sword"). Recomendo, principalmente porque dá às nossas crianças uma perspectiva dos sonhos e expectativas de outras crianças noutras partes do mundo. Written by a truly inspirational young person, this book discusses the importance of education and how it should not be taken for granted. Even though it is written simply, the illustrations in the book enable for more emotion to be radiated when reading this book, so much so it left me with my hairs on end. Fantastic for children to see how lucky they are that they are able to go to school with no issues and how other children do not have the privilege to go to school. This is a lovely little book. Between the uplifting, hopeful message and the delightful illustrations, it's an enjoyable and educating read. I haven't read Malala's full-length memoir, but this picture book is a nice introduction to her story. It doesn't get too scary or graphic for kids (for example, what happened to her at the hands of the Taliban isn't explicitly stated), but it's still able to get the main points across, showing children how much of a struggle getting a basic education is in This is a lovely little book. Between the uplifting, hopeful message and the delightful illustrations, it's an enjoyable and educating read. I haven't read Malala's full-length memoir, but this picture book is a nice introduction to her story. It doesn't get too scary or graphic for kids (for example, what happened to her at the hands of the Taliban isn't explicitly stated), but it's still able to get the main points across, showing children how much of a struggle getting a basic education is in certain parts of the world. Ok I need this book in my school's library (I'm a teacher) like, yesterday. Malala is so brave to have stood up for and to continue to stand up for everything, and I love the message that even if our pencil is not "magic" we can make it so because one pencil paired by what we do and say can change things. Have wanted to read this for a long time. Touching, inspirational and powerful! I love how Malala’s story is told reaching and inspiring younger readers. Fantastic illustrations throughout and much to offer for discussion with any child and class.